Romance awaits a few steps above the River Walk. : Once housing a somewhat scruffy restaurant a few steps up from the River Walk, the cave-like space that harbors Bella now seems an asset, one that emphasizes romance over rusticity. 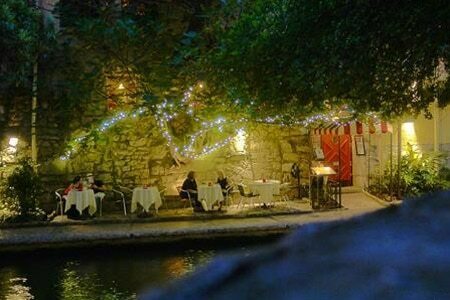 Enjoy a cozy dinner inside amid the candlelight and limestone rock walls, or try to snag one of the al fresco tables right along the water. The menu skews Mediterranean but also features dishes with some local flair, as in the chicken-fried Texas quail with Gorgonzola cream and arugula. Chef Sean Fletcher's way with fish is showcased in Texas redfish with orange-carrot jus and watercress. Carnivores will be satisfied by filet mignon and steak au poivre. Come dessert time, choose from white chocolate bread pudding, berry sabayon or pistachio cake. A few decent wines are available as well.